Share a Cuppa with Fido? Really?! Does your dog or cat try to sneak a sip of your morning tea? Ever wonder if you should offer your pet its own cup? According to Dog Behaviorist and Canine Holistic Wellness Advisor, Karen Rosenfeld, you not only can but should give your pets their own cup of tea. 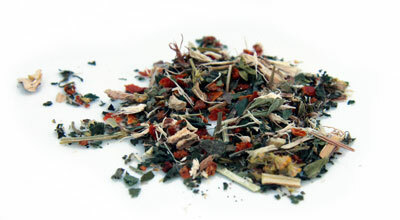 To optimize the health benefits of a tisane, choose organic when available or use fresh herbs from your garden. In addition, pay careful attention to the size of your pet, adjusting the dose accordingly. Rosenfeld recommends 1/16 teaspoon of dried herbs for dogs and cats that are up to 10 pounds and no more than 2 teaspoons for dogs over 100 pounds. As far as teas to avoid, black and caffeinated green tea should never be given to pets. Caffeine can be extremely toxic for your four-legged friend. Rosenfeld recommends tea to most of her holistic clients and offers a cup of tea to her pooches on a daily basis, brewing either decaffeinated green tea or rooibos. The tea is cooled then poured directly on top of their food. The benefits of rooibos tea for pets are similar to those in humans, offering a boost to their immune systems. 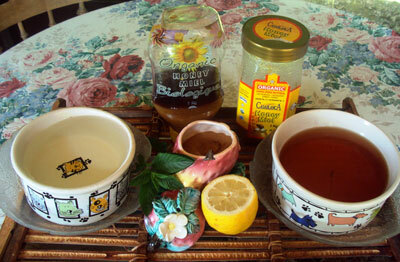 Rooibos also works wonders, shares Rosenfeld, for those pets that are suffering from skin allergies and anxiety. Decaffeinated green tea and its extract may assist with a variety of ailments in pets, from treating cancer to assisting with bad breath. “Green tea is fantastic for dogs, providing that you are using decaffeinated and to adjunct the antioxidant properties of the green tea, you should use fresh lemon juice,” said Rosenfeld. She recommends using green tea for everything from topically treating an eye infection (3 to 5 drops in the eye) to cleaning your pet with a green tea body wash. However, the ASPCA recommends using green tea with caution, advising that even with decaffeinated blends; some pets may experience stomach pain. Wary about giving your pet green tea? Have no fear, other herbs can be just as beneficial. Chamomile (either the tea or flower) is wonderful for reducing anxiety and also to topically treat eye infections. Meanwhile warming ginger root, either as tea or placed directly in food, can help relieve nausea and improve vascular circulation. This is particularly beneficial to dogs with short fur that may be sensitive to cooler nights. In fact, she regularly gives ginger root to her boxer Robbie, adding the root to his daily salad. “Tisanes are a valuable nutraceutical for dogs,” said Rosenfeld. “If you choose not to give them, you will lose access to some amazing health benefits.” Whether you choose to make your own or buy a blend created for pets, take the time to share a cup with your pet today. Cautionary Note: When using herbs as part of a treatment plan, it is important to check for any potential interactions with medications. In addition, always double check with your veterinarian to make sure that both the herbs and dosage are safe for your pet to consume. The most commonly consumed health drink! Green tea is the most commonly consumed health drink in the world. 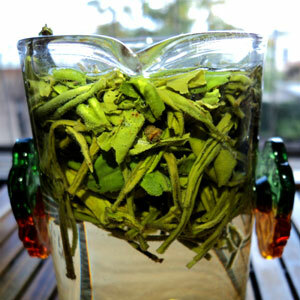 However, to reap green tea's full benefits, you must drink enough each day. Also, it is important to choose a naturally grown green tea. Green tea contains high concentrations of antioxidants known as polyphenols, according to the University of Maryland Medical Center. It seems the world has the right idea, because green tea offers many health benefits, including helping to keep your heart healthy. Green tea has been shown to fight atherosclerosis, a condition that causes cholesterol to build up in your arteries. This narrows your arteries, restricting blood flow. Eventually, atherosclerosis can lead to coronary artery disease. Some research studies have shown green tea drinkers experience a reduced heart disease risk. Green tea may also raise levels of high-density lipoprotein, or HDL, the good cholesterol that helps to reduce your harmful LDL cholesterol levels. The catechins in green tea are not only helpful in fighting cancer, but they help the body burn fat as well. In a Japanese study at the Department of Animal Science at Shizuoka University, researchers fed green tea powder to mice for sixteen weeks and observed the changes in their bodies and habits. The researchers noted that the mice fed the powder ate less, gained less weight, and accumulated less fat in their bodies than mice in the control group. This led researchers to conclude that green tea may be effective in reducing body weight. Green tea may be helpful in preventing blood sugar spikes, which is advantageous for everyone, but for diabetics in particular. According to the Pacific College of Oriental Medicine, "Diabetes, which is even more common than high blood pressure, can actually be kept under control by consuming green tea. Starch in any form is converted into sugar, and this is done with the help of an enzyme called amylase. The polyphenols present in green tea extract reduce the amount of amylase produced; thus, the levels of sugar in the blood also decrease." MedlinePlus ranks green tea as "possibly effective" for preventing some cancer types, including bladder, esophageal, ovarian and pancreatic cancers. A study published in the February 2013 issue of "Cancer Epidemiology” found Chinese women who drank green, black and oolong tea experienced a reduced ovarian cancer risk. Furthermore, researchers found the more tea a woman drank, the lower her risk for ovarian cancer. While laboratory studies have shown reduced risk for cancer, studies in people have not yielded definitive results, according to the National Center for Complementary and Alternative Medicine. The antioxidants in green tea help lower LDL (bad) cholesterol, and help increase HDL (good) cholesterol. They also improve artery function. According to a study published in the 2006 issue of the Journal of the American Medical Association (JAMA), “drinking green tea lowers the risk of death due to all causes, including cardiovascular disease.” The researchers demonstrated that women who drank five or more cups of green tea a day had a 31% lower risk of dying from cardiovascular disease than women who drank less than one cup of green tea per day. Likewise, men who drank five or more cups of green tea per day had a 22% lower risk of dying from cardiovascular disease than men who drank less than one cup of green tea per day. Caffeine in your green tea may not be all bad -- drinking green tea has been shown to improve mental alertness and thinking, according to the University of Maryland Medical Center. Additionally, green tea's warmth can soothe your throat. So, drink up -- green tea is good for you. While the amount of polyphenols in green tea can vary among brands, the University of Maryland Medical Center recommends drinking 2 to 3 cups each day. This will provide about 240 to 320 milligrams of polyphenols.